Anti terrorist unit is hunting for five suspected Al Shabaab suicide bombers said to be planning a major terrorist attack in the country. The five who include woman who is said to have been married to several members of the terror group of Jeysh Ayman. Jeysh Ayman is an al shabaab gang which attacked the Kenya Defence Forces in camp Baure, Lamu County 4 months ago. Most of the gang members have been killed by the military and some are still at large. “Some of the attackers of Baure camp have been traced as having roots in Nairobi. Investigations continue into the activities and locations of these youth attacking Kenyans,” a police intelligence said. 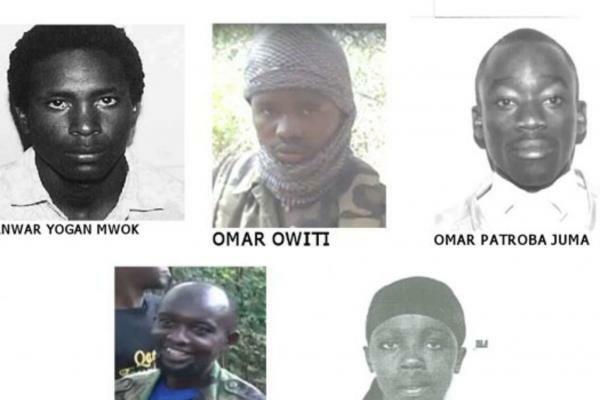 According to the report, Omar Owiti and Ramadhan Kioko are operatives of the al shabaab who comes from nairobi. The others i the report include Patroba Juma Owiti from Siaya and Anwar Mwok and Husband to Shamim Wanjiru Hussein who are said to be living somewhere in Umoja. The intelligence report also say that Anwar owns several properties and business within Nairobi's Umoja estate some of which have been recently sold to finance the organisation's operations. Shamim is said to be around the age of 26 and he is a suicide bomber born in Pumwani Nairobi and has also been married to several al shabaab operatives. Some of her alshabaab husbands include Swaleh Kibet, who was killed in Somalia fighting for the group. Police have asked members of the public to provide any information that might lead their arrest.